Our College has the advantage of urban location surrounded by lower middle class community. We have a constructive for working on various outreach and extension activities. We also have Social Cell – the tag line of which is “Working with a Smile to bring back a Smile”. Through social cell NKare we try to support the economically weak sections by donating stationery and also by spending some quality time, playing games and having fun with them. Rakhi, Friendship band and Chocolate sale : The College conducted the sale of Rakhi, Friendship band and Chocolate. The profits generated from the drive were used in sponsoring the school fees of 7 underprivileged children from Gujarati medium of NL high school. Visit to Orphanage: Members of Social Cell visited the Honeycomb Orphanage home at Bhayander. There students spent some quality time with the children there by having lot of fun and playing games. Stationary collected was distributed to the children. Foodgrains were also donated. Clean Up Drive: After the Ganesh Visarjan the members took an initiative of Clean Up drive at Juhu Beach. An immense response was seen on the part of the students for their contribution for the betterment of society. Collaboration with Blue Ribbon : Blue Ribbon is an Non-Government Organization which deals with social and Leadership forum in which they not only enhance the leadership qualities of an individual but at the same time train individuals to deliver their service to the society. Social cell students took into hand one of the very important concern of today of making people aware of their voting rights. Students went door to door in Malad area for creating an awareness of voting amongst people, for which they were also awarded by the Organization. Program of Intellectually Disabled Children : Social cell Members attended the program of Intellectually Disabled children named “Big Wonders”. The objective of the program was to create awareness amongst students for such type of children and their pattern of life. Stationary Drive : Social Cell planned to conduct Stationary Drive. The stationary collected through the drive were distributed among the underprivileged students as well as in Orphanage. 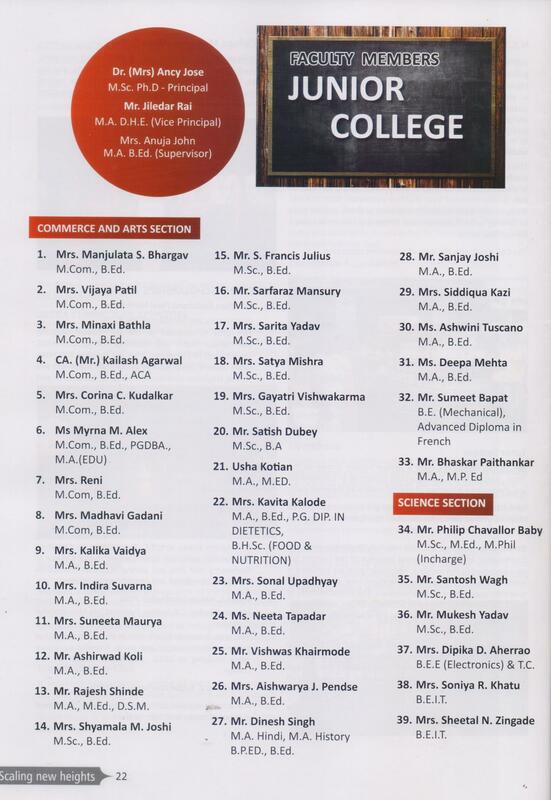 Our college is a recognised as Lead College by University of Mumbai. The college is a cluster for CAP (Centralized Assessment Programme) for UG and PG , where faculty from neighbouring colleges comes for paper Assessment/Moderation. The students and faculty from other colleges and educational Colleges visit our College to participate in various events. > QUEST - ‘Harnessing the Skills of Gen - Y’.